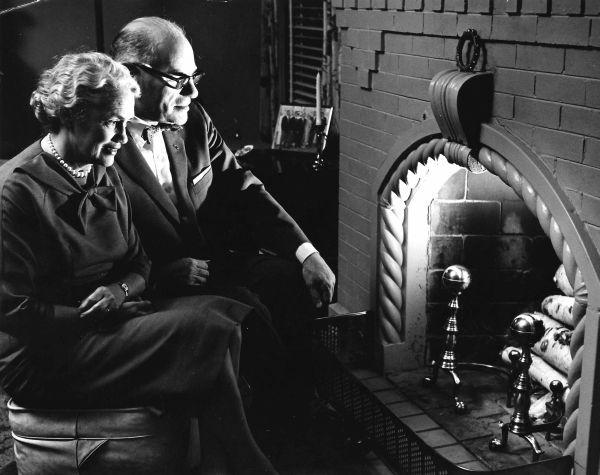 The December, 1961, Wheaton Alumni magazine features on its cover a photo of President and Mrs. Edman sitting cozily before a blazing holiday hearth, probably at their home, Westgate. Twenty years ago this fall, as a new Wheaton freshman, I sat with hundreds of others on the lawn of front campus to witness the dedication of the Billy Graham Center. Sharing the platform with Dr. Graham ’43 and President Hudson Armerding ’41 was the keynote speaker, Charles Malik, a Lebanese educator and statesman whose words profoundly changed my attitudes toward learning and the gospel. Malik’s central argument was that Christians in general and North American evangelicals in particular stood little chance of having a deep impact upon their society unless they proved able to know and influence the intellectual life of the world. We are, he contended, admonished to save both the soul and the mind. The speech found such resonance in the College community that it was quickly published in pamphlet form as The Two Tasks. Malik’s words, together with my subsequent four years at Wheaton, helped me begin to see past my dualistic and utilitarian views of evangelism and education. While working with evangelical student groups in the city of Munich in the late ’80s, I found that Christian students in Germany also had a strong desire to view their studies from within the context of their faith. But my German friends wondered how they could ever hope to think as Christians or share the gospel with their peers when they could barely see past the boundaries of their own disciplines. Wheaton has long valued the integration of faith and learning and the wholeness of a liberal arts education. Since joining the faculty four years ago, I’ve been a part of two initiatives geared toward helping students and professors work more effectively at the two tasks envisioned by Malik. The first is Freshman Experience, a required course in which students explore such issues as consumerism, forming a Christian worldview and the theology of work and leisure. Above all, Freshman Experience mentors aim to get students excited about being students, to encourage them to see their studies and other activities not just as means to an end, but as part of the work of the kingdom. Not surprisingly, The Two Tasks occupies an important place in the syllabus. During the 1999-2000 academic year, I benefited from the second initiative: the new faculty Faith and Learning seminar, which might be considered the postdoctoral equivalent of Freshman Experience. Our eclectic group (representing 11 departments) discussed topics ranging from biblical ethics, to Christology, to ways of knowing. It was inspiring to see that God had called such different people to pursue scholarship in a single Christian academic community. Though there was ample disagreement, we were united in our desire to think, speak, and live as new creations in Christ. How well is Wheaton carrying out the two tasks that were laid upon us two decades ago? My experiences in the classroom and the seminar room over the past year give me reasons to be optimistic. I’ve observed colleagues and students striving to love God with all their hearts, souls, and minds. In my own teaching and scholarship, whether it be analyzing the roles of prayer and providence in a recent German film or outlining cultural differences in a Business German course, I’ve found that true joy comes in pursuing both of the two tasks wholeheartedly. Dr. Clint Shaffer ’84 is an assistant professor in the department of foreign languages and director of the Wheaton in Germany program. He received his M.A. from Middlebury College and his doctorate from the University of North Carolina at Chapel Hill. His scholarly presentations and publications deal with 18th- and 20th- century literature, German cinema, and foreign language pedagogy. His current research is a study of Christian responses to Asian religions during the German Enlightenment. He and his wife, Virginia Davidson Shaffer ’84, are the parents of Bill (5) and Sarah (3), and enjoy introducing Freshman Experience students to Chicago-style pizza. Today’s a high alert day in New York. I have been spending a few days in the Bronx with friends, and last night came back on the commuter train after dinner down in Manhattan. At a quarter before midnight, Grand Central Station was filled with National Guard men and women, dressed in camouflage and carrying large machine guns. I have certainly seen guards with guns stoically surveying a crowd, but, previously, they were in other countries and at the borders of other lands. Now they stand in our train stations, at our borders and airports. Headed home that night, I realize that I increasingly find myself asking what it means to love our enemies. How, concretely, are we to be a neighbor to those who hate us? Jesus clearly asks us to pray for our enemies, and surely this includes asking God to convert the hearts and save the souls of Osama bin Laden and the members of Al Qaeda. But are we called to even more? Consider the language that we use in describing our enemies. I admire President Bush’s concern for what is moral; he has strong and courageous convictions regarding good and evil. But there is also a danger in calling any particular person evil. In calling someone “evil,” we run the risk of painting her as fully irrational, without reason or cause for her actions, as “other” than us. In so doing, we too easily allow ourselves the luxury of not asking why our enemy hates us, whether we have done something to wrong another, or whether we ourselves have also sinned. In calling the other “evil,” it becomes easy to presume that we are the innocent ones and are not therefore required to engage in self-examination, confession, and genuine repentance. Our country and the American church certainly should be concerned about safety and protection. The guards, soldiers, police, and firefighters who have risked and given their lives for greater security for the rest of us are to be admired and thanked. But even as we are grateful for their great sacrifices, we should also take up the difficult and ongoing task of loving our enemies–praying not only for the salvation of our enemies’ souls, but also praying for our own souls and the full sanctification of all members of Christ’s church, that we may be presented to Him as a Bride without spot or blemish. Sarah Borden ’95 is an assistant professor of philosophy at Wheaton. She holds master’s (1998) and doctoral degrees (2001) in philosophy from Fordham University in the Bronx. She has recently completed a book on Edith Stein for the Outstanding Christian Thinkers series and is a great, great grandchild of Hermann Fischer, Sr. (class of 1870) and a great, great, great grandchild of Jonathan Blanchard, Wheaton’s first president.